"Raven's" redirects here. It is not to be confused with Raven (disambiguation) or Ravens (disambiguation). ^ Bilker, Warren B.; Hansen, John A.; Brensinger, Colleen M.; Richard, Jan; Gur, Raquel E.; Gur, Ruben C. (2012-09-01). 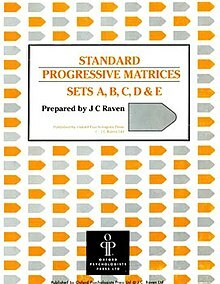 "Development of abbreviated nine-item forms of the Raven's standard progressive matrices test". Assessment. 19 (3): 354–369. doi:10.1177/1073191112446655. ISSN 1552-3489. PMC 4410094. PMID 22605785. ^ a b Kaplan, R. M., & Saccuzzo, D. P. (2009). Standardized tests in education, civil service, and the military. Psychological testing: Principles, applications, and issues (7 ed. pp. 325–327). Belmont, CA: Wadsworth. ^ Raven, J. C. (1936). Mental tests used in genetic studies: The performance of related individuals on tests mainly educative and mainly reproductive. MSc Thesis, University of London. ^ a b c d Domino, George; Domino, Marla L. (2006-04-24). Psychological Testing: An Introduction. Cambridge University Press. ISBN 9781139455145. ^ Flynn, James R. (March 1987). "Massive IQ Gains in 14 Nations: What IQ Tests Really Measure" (PDF). Psychological Bulletin. 101 (2): 171–191. doi:10.1037/0033-2909.101.2.171. Retrieved 13 May 2013. ^ Thorndike, R. L. (1977). "Causation of Binet IQ decrements". Journal of Educational Measurement. 14 (3): 197–202. doi:10.1111/j.1745-3984.1977.tb00036.x. ^ Dawson M, Soulières I, Gernsbacher MA, Mottron L (2007). "The level and nature of autistic intelligence". Psychol Sci. 18 (8): 657–62. doi:10.1111/j.1467-9280.2007.01954.x. PMC 4287210. PMID 17680932. Lay summary – ScienceDaily (2007-08-05). ^ Dawson M, Gernsbacher MA, Mottron L (2011). "The level and nature of autistic intelligence II: What about Asperger Syndrome?". PLoS ONE. 6 (9): 657–62. doi:10.1371/journal.pone.0025372. PMC 3182210. PMID 21991394. Lay summary – ScienceDaily (2011-09-02). ^ "Test Scores". www.triplenine.org. Retrieved 21 January 2019. ^ "The International High IQ Society - Sign-up". www.ihiqs.org. Retrieved 21 January 2019. Raven, J., Raven, J.C., & Court, J.H. (2003, updated 2004) Manual for Raven's Progressive Matrices and Vocabulary Scales. San Antonio, TX: Harcourt Assessment. Raven, J., & Raven, J. (eds.) (2008) Uses and Abuses of Intelligence: Studies Advancing Spearman and Raven’s Quest for Non-Arbitrary Metrics. Unionville, New York: Royal Fireworks Press. This page was last edited on 11 February 2019, at 08:11 (UTC).